Following an unexpected drop in sales in July, Australian tractor sales bounced back in August and are now 10.8 per cent ahead in dollar terms on last year on a year-to-date basis, writes the TMA's Gary Northover. 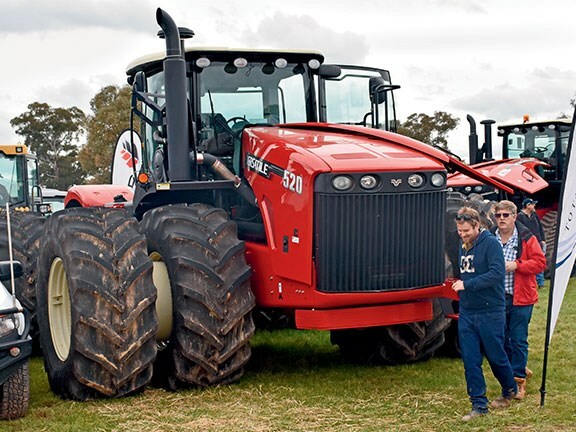 The August improvement was led by larger horsepower tractors in New South Wales, Queensland and Western Australia. The only soft spot was the under-40hp range that contributed to the ongoing weakness in Victoria, which was 25 per cent down on last month and is 15.5 per cent behind on a year-to-date basis. The Victorian position is no doubt due to the continued stresses being felt in the dairy space, along with an extended winter period. However, we expect an improvement in small tractor sales as spring warms up. Sales of tractors in the 40-100hp range were up 14 per cent for the month, with the next range, 100-200hp, up 2.6 per cent. The largest group, the 200-plus range, took a breather this month, falling 4.9 per cent. However, it was up 12 per cent on a year-to-date basis. Tractors sales in NSW are a standout as that state’s economy continues its impressive run. Sales for the month were up 22 per cent on last month and are now 16.6 per cent up year-to-date – certainly a highlight. Elsewhere around the nation, Queensland and WA reported solid sales growth in excess of 10 per cent, while Tasmanian tractor sales jumped by 35 per cent. The Northern Territory was the only other region showing a decline, while tractor sales in South Australia remained largely steady. It’s not just tractors that are moving at the minute, as sales of combine harvesters went a long way towards reversing last month’s result with a whopping 52.3 per cent increase in sales. Combine harvester sales are now two per cent up on a rolling 12-month basis. Balers also continue to perform strongly with a 32 per cent increase on last month, and posting 2.4 per cent growth on a rolling 12 months. Finally, the sales of out-front mowers continue to soar, up 40 per cent on last month and 18.5 per cent up year-on-year. The stage is now set for what looks certain to be another strong year for tractor sales. Interest rates are low, the weather has been kind, and demand for most commodities remains strong. Importers and manufacturers are generally reporting solid order books and lead times remain stretched. Australia appears to be a hot spot for machinery sales for most international manufacturers. This spring will see a raft of new products being introduced, with many being showcased at the various field days being held around the country, and we encourage all to get out and support the industry and see what is on offer.